In recent times, the level of insecurity in Nigeria has increased significantly, due in no small measure to the activities of the ‘Boko Haram’ (which means Western or non-Islamic education is a sin) Sect. The extremist group, whose official name is Jama'atu Ahlis Sunna Lidda'awati wal-Jihad, is fighting to establish Sharia law in Nigeria and is reportedly responsible for the spate of killings and bombings mostly in the Northern part of the country. Arguably, the most notable of Boko Haram’s attacks was on the 26th August, 2011 bombing of the UN main office in Abuja - where 26 humanitarian and development agencies are based – which killed at least 18 people. In a bid to address the security fears of Nigerians, the Federal Government has deployed security forces in the areas where the group is known to be operational as well as set up a committee to review security problems in the area, and make recommendations for bringing a timely end to the Boko Haram crisis. NOI Polls decided to quiz Nigerians about their views on the extremist sect as well as their confidence in the Government’s ability to provide security for the citizens of this country. 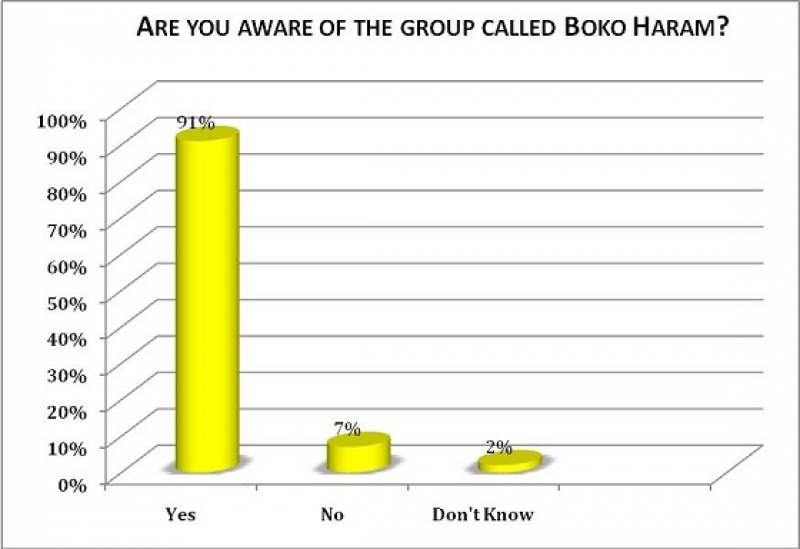 The results of the survey show a high level of awareness of the sect with over 9 in 10 respondents answering ‘Yes’ when asked if they were aware of a group called Boko Haram. 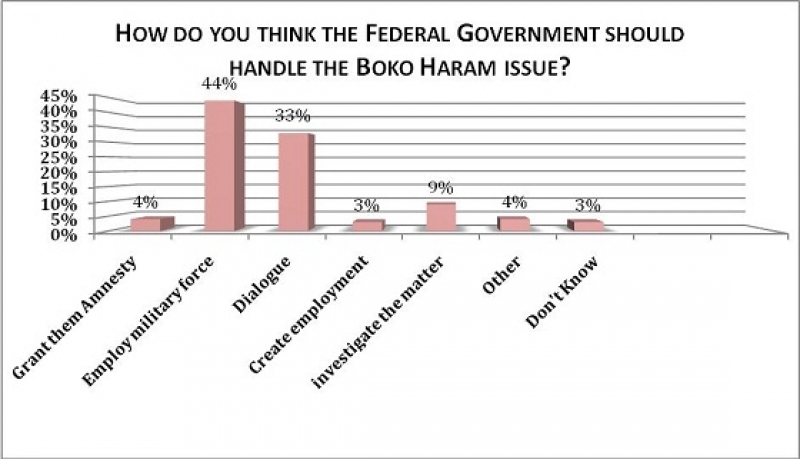 When asked how they think the Federal Government should handle the Boko Haram Issue, the largest proportion of respondents (44%) of the respondents said that the government should employ military force; the second largest proportion (33%) said the government should engage in dialogue with the group and, only 4% respondents agree that the FG should grant amnesty to the terrorist group. 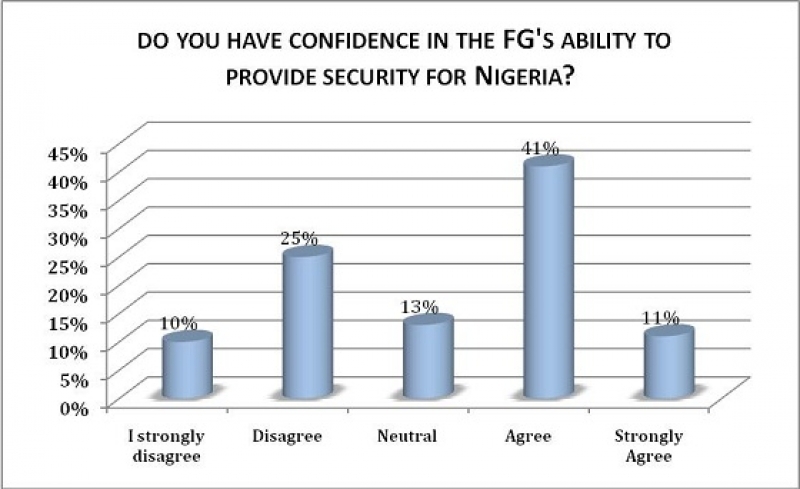 Respondents were asked if they had confidence in the government's ability to provide security for Nigerians. 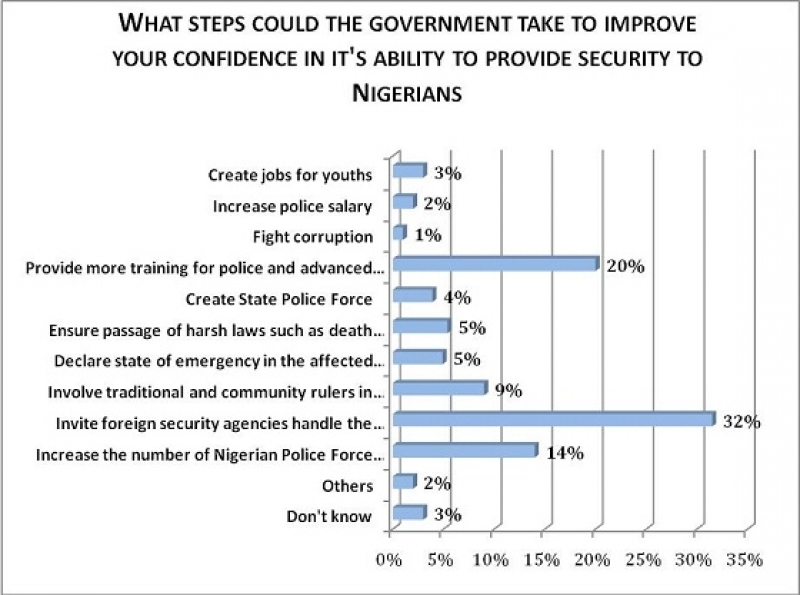 52% of respondents expressed at least some confidence in the government's ability to provide security for Nigerians while just over a third (35%) said they lacked confidence in the government's ability to provide security. The35%of respondentswho said that they lacked confidence in the government's ability toprovide security were asked what the government could do to increasetheir confidence. 32% said that the government should invite foreignsecurity agencies handle the situation; 20% said the governmentprovide more training for the police and provide them with modernequipments while 14% said the FG should increase the number of theNigerian police force in each state. However, 3% believes thatcreation of jobs will help reduce security problem while 2% believeimproving the salary of police officers will help them focus more onthe job, thereby reducing security threats as a result. Respondentsfor the snap polls were randomly selected from a database ofphone-owning Nigerians aged 18 and above across the six geopoliticalzones in the country. For this survey, 1155 people took part in thetelephone interviews conducted from the 3rdand 8thof August, 2011. For a sample of this size, we can say with 95%confidence that the maximum margin of sampling error is ±3percentage points. Thispoll is part of the ongoing snap poll exercise conducted by NOI Pollsto rapidly assesspublic sentiments following various social, political or economicevents. NOI Polls is aNigeria based opinion research organization, which worksin technical partnership with Gallup Polls (USA), to conduct periodicopinionpolls on various socioeconomic issues in Nigeria.